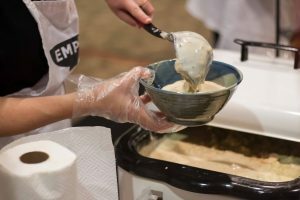 The Oxford Food Pantry welcomed hundreds of guests to the Oxford Conference Center yesterday afternoon for its 16th annual Empty Bowls Lunch. 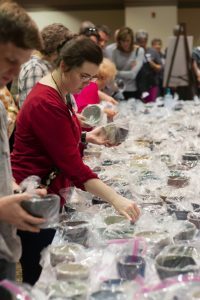 Attendees purchased homemade craft bowls for $20 and filled those bowls with their choice of soup provided by local restaurants or vendors at the event. The proceeds from the pottery sales go to Oxford Food Pantry, which provides food to those in need. Ron Dale, one of the event’s organizers, said the luncheon has grown substantially over the years and is the pantry’s main fundraiser. Each bowl is hand-crafted and donated by the Ole Miss Mud Daubers, a group of advanced student ceramicists, and other local potters. “No matter what is on the bowl or the shape of the bowl, that just reflects the person who made it,” Dale said. Dale said the purchased bowls can serve as a reminder that many people in Mississippi suffer from food insecurity. Many local restaurants, including Boure, City Grocery and McEwen’s, served their signature soups. Oxford Mayor Robyn Tannehill greeted guests at the door and volunteered as a server. She said the annual event brings out the best in the Oxford community by encouraging service to others in a creative way. Empty Bowls got its start in 1990 as an art project at a Michigan high school. Its purpose was to raise money for a food drive. Students created ceramic bowls to serve soup and bread in, and now, the idea has expanded internationally, helping to feed the hungry and support the arts. 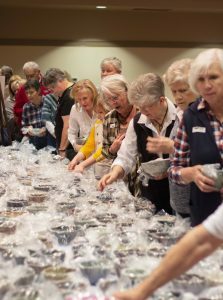 The luncheon raises an average of $15,000 every year for the Oxford Food Pantry, which provides for up to approximately 40,000 meals a year for local residents in need. Donna Patton, the University of Mississippi Foundation stewardship coordinator, said she attended the event because she enjoys having a good time while supporting a good cause. The Oxford Food Pantry is open from 8:30 to 11 a.m. to Lafayette County residents under 65-years-old on Wednesdays, and residents over 65 on Thursdays.